…and then we have to get rid of cars. These people need jobs! Or how about we just submit to Islam? Sky News understands that there were two men in the vehicle that ploughed into pedestrians on Flinders St. The vehicle jihadist has been arrested after his car hit pedestrians on Flinders Street. THESE are the first photos to emerge from Flinders St where paramedics treated at least 13 people after they were hit by a car. Flinders Street suspect cuffed on the floor. Will we ever find out what motivated him? THERE is enough crime in Australia without successive governments importing large numbers of people incapable or unwilling to respect our laws. The mother of the truck driver murdered by failed asylum seeker terrorist Anis Amri last Christmas has blamed Angela Merkel. All these evil Leftist politicians, media whores and educators promoting open borders and globalism should be arrested and jailed for life for TREASON, for the endangerment of our people, for the Islamization and sell out of our countries. Since being imprisoned, Adebolajo has lost his two front teeth when prison staff at Belmarsh tried to restrain the vile terrorist.But now the death-worshipper has launched an official court writ, claiming he has been left with a “psychiatric injury”. The immigration minister has accused asylum-seekers on Manus Island of “lying” and producing propaganda after they released video footage allegedly showing locals threatening them. POLICE command has warned officers they are at risk of being lured into ambushes following a recent string of terrifying attacks by youths in Melbourne’s western suburbs. THE Lakemba Mosque has issued a fatwa against Christmas, warning followers it is a ”sin” to even wish people a Merry Christmas. Yesterday I asked the Community Affairs Legislation Committee some questions about the preferential treatment refugees are receiving when it comes to access to public housing over other Australians. Some who have been on waiting lists for years. I also asked whether any preferential treatment was also given to our homeless veterans. But you can probably already guess what the answer to that question was. What did you think of their answers? 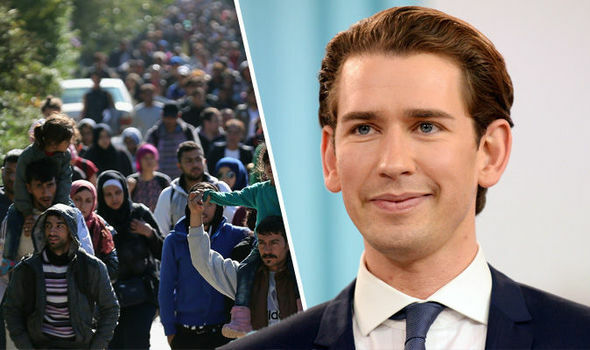 AUSTRIA has introduced a hardline new migrant policy following the swearing-in of its new coalition government. We can make an educated guess about motivation. The driver sped up to 60/70 through a red light and has the ‘hate beard’ so let’s connect the dots. Islam at work again in all likelihood, doing what the koran commands. Slaying the infidel. Stop importing them cause bollards ain’t going To stop these barbarians Danny boy. Looks like a couple of pedestrians will die. Hope not.